Be the first to share your favorite memory, photo or story of Merrill. This memorial page is dedicated for family, friends and future generations to celebrate the life of their loved one. 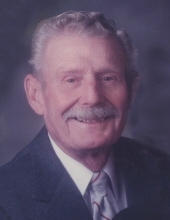 Koosharem, Utah - Our beloved father, grandfather, great-grandfather and friend, Merrill Emmett Erickson, age 94, of Koosharem, passed away March 25, 2019 at the home of his son in St. George. He was born May 30, 1924 in Koosharem, Utah, a son of Otto Fredrick and Clara Ovena Nielsen Erickson. He served his country in the United States Marine Corp during World War II. Merrill married Leah Bernice Chidester March 23, 1946 in Bicknell, Utah. They were later divorced. He married Betty Ruth Ward Reutter December 10, 1966 in Las Vegas, Nevada. She died March 17, 2007. Merrill was a member of the Church of Jesus Christ of Latter-day Saints. Merrill loved the great outdoors especially hunting and fishing with his family. He was an avid reader. Normally he had 3 to 4 books he was reading at any given time. At almost 95 years old, he was still an excellent driver. He enjoyed planting a garden and was a wonderful cook. He retired from Hughes Aircraft in California and absolutely loved his job as an Electrician as well as helping others in any way he could. As our Father, Grandfather and Great-Grandfather, we will cherish and treasure the memories we have of this kind and loving man always in our hearts. Merrill is survived by his children: Judy Dale of Koosharem; Kelly and Alice Erickson of St. George; Debbie and Rex Tanner of Lyman; Colin and Jody Erickson, Michael and Pat Reutter, all of Monroe; Gilbert and Loretta Reutter of Las Vegas, Nevada. He is preceded in death by an infant son, Lee Merrill Erickson; and a son, William "Bill" Erickson; a son-in-law: Benjamin Dale; and a granddaughter, Corey Day Desmond. Funeral services will be held on Saturday, March 30, 2019 at 1:00 P.M. in the Koosharem LDS Ward Chapel where friends may call for viewing Saturday from 11:30 to 12:30 prior to the services. Burial with military honors accorded by the Harold Brown American Legion Post #92 and the United States Marine Corp Honor Guard will be in the Koosharem Cemetery under the care of the Springer Turner Funeral Home of Richfield and Salina, Utah. To send flowers or a remembrance gift to the family of Merrill E. Erickson, please visit our Tribute Store. "Email Address" would like to share the life celebration of Merrill E. Erickson. Click on the "link" to go to share a favorite memory or leave a condolence message for the family.